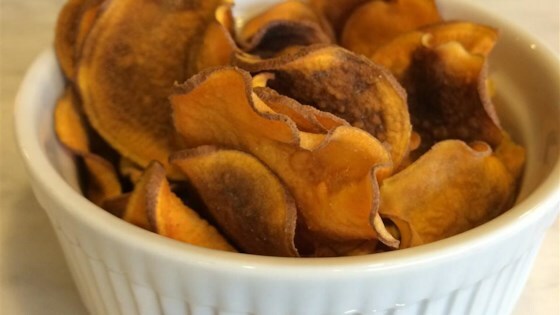 "Sweet potato chips never get crispy enough for me in the oven, but this microwaved version works like a charm!" Combine sweet potato slices and and olive oil in a large bowl; toss to coat. Arrange sweet potato slices in a single layer on a large microwave-safe plate; season with salt. Cook in microwave until chips are dry, crisp, and slightly browned, about 5 minutes. Cool chips on plate before transferring to a bowl. Repeat with remaining sweet potato slices. An inexpensive Japanese mandolin will insure you get thin slices. Used coconut oil, a little maple syrup, and a dash/pinch of cayenne. Perfect combination. A REAL treat you don't have to feel guilty about!!! It took me 9 minutes to get these crispy, but they were pretty good, and better than in the oven. 13 year old girls liked them. Shared these with my co-workers. They were really surprised how good they were. Will definitely make these OFTEN.